The man earned his nickname. He was known as "The Hammer" to fans and teammates on the teams in which he played. He was also known as "Hammerin' Hank" to many. He earned his reputation by steadily and surely hitting out one home run after another. 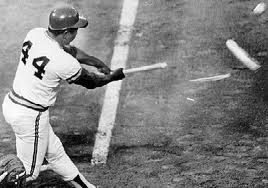 He eventually ended up with the record of most home runs in a career, a record that stood for a very long time. He ended his career with over 700 home runs. What many people do not know is just how many barriers that Aaron broke down to end up with that record. While Jackie Robinson became famous as the first African American to break through the color barrier, Hank Aaron did his part in making sure that barrier was down once and for all. All the while he continued to give outstanding play on the field, while behind the scenes his team had to deal with things like death threats and the press that covered his accomplishments had to do the same. There was a time when it seemed like Aaron was a good candidate to beat Babe Ruth's career home run record. In 1973 it looked like he was going to accomplish this. During the last game of the season Aaron it looked like he would tie the Bambino's record. He already had 713 home runs under his belt. He did not achieve the goal of tying the record, but then stated to the press that he feared for his very life during the off season. It turned out, there were others who worried about that as well. Aaron was playing for the Atlanta Braves at the time. He would spend much of his career playing for them. However, he was also in the deep south, about to break a record held by a white man for a long time. Prejudices against that kind of thing were still deep in Atlanta. The local newspaper, the Atlanta Journal, began getting death threat letters because they dared to cover Aaron's pursuit of Ruth's record. One sports columnist decided to secretly write an obituary about Aaron because he feared for the man's life so much. When the rest of the country heard about the bigotry and hatred that Aaron received, there was an outpouring of support from sports fans. Even Charles Schulz, creator of the Peanuts cartoon, ran a series of comic strips where Snoopy attempts to break Ruth's record in a show of support for Aaron. Of course, Aaron did break the record. 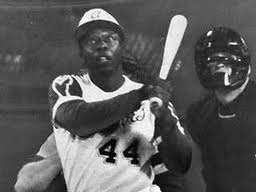 He hit the record-breaking homerun, number 715, against the Los Angeles Dodgers on April 8, 1974. Since then, Aaron has remained a busy man and staunch supporter of baseball. Aaron continues to help run organizations that keep baseball at the forefront in sports. He has even teamed up with sluggers from other countries to help create baseball camps for young men and women around the world. He also firmly supported Barry Bonds when Bonds broke Aaron's home run record. The man had a hammer. Not only did he break records, he broke down barriers, and he's still trying to swing that hammer even after his retirement.